Google recently introduced a mode called "Browse By Name", a cross between "I'm Feeling Lucky" and a normal Google search. "Browse By Name" acts like "I'm Feeling Lucky" if Google is certain that the first hit is correct, but otherwise returns a normal set of search results. 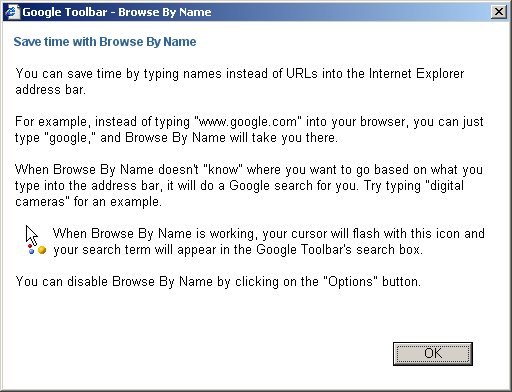 If you use Internet Explorer with the Google Toolbar, "Browse By Name" is the default behavior for non-URLs typed into the address bar. The Google Toolbar shows a dialog the first time you use the feature. By default, Firefox uses "I'm Feeling Lucky" for non-URLs typed into its address bar. You can change the behavior by going to about:config and setting keyword.URL to the appropriate URL and then restarting Firefox. This entry was posted on Thursday, September 9th, 2004 at 3:41 am	and is filed under Google, Mozilla. You can follow any responses to this entry through the RSS 2.0 feed. Both comments and pings are currently closed. Gids filed http://bugzilla.mozilla.org/show_bug.cgi?id=258838 for making Firefox’s default be “Browse By Name”. When typing “digital cameras” it goes to a website. It does not do a Google search for me. Is this a Firefox thing? Do I need the Google Toolbar?